Bewitched tarot box, Lisa Parker design. 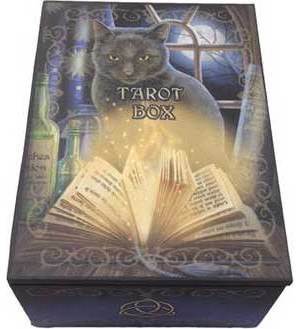 A lovely little box that fits most tarot oracle decks, can also be used for trinkets, or small treasures. Felt lined inteirior and bottom. designed from the worlds leading Fantasy Artists. 5 1/2" x 4". Pentagram and Celtic Cupboard 11"